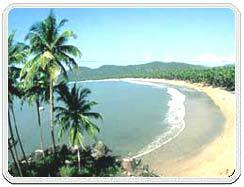 Palolem is probably Goa's most beautiful and idyllic beach and it has 1.5 km crescent shaped beach. 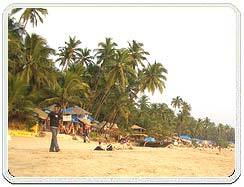 The beach lies on the southern coastline of Goa amidst outstanding natural beauty. The sweeping crescent of white sand is fringed by a shady rim of coconut palms and the whole beach is hemmed in at either end by rocky crags. It is fast emerging as a popular spot for day-trippers from Colva and Calangute, many travellers drift down from the northern beaches to spend days, weeks or even months chilling out here; there is very little development and it's extremely laid-back. Most accommodation is in simple, rickety beach buts or villagers homes, with a handful of more solid guesthouses scattered around. Palolem Village is nestled in the palms back from the beach. With the large influx of tourists to the Northern beaches and the resultant increasing commercialisation of these places. 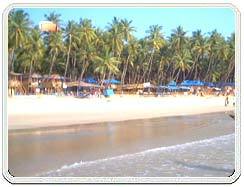 Palolem fits the bill and in recent years, more and more tourists have been making a beeline for this palm fringed golden beach. With the beach now lined along its entire length with brightly lit shack cafes, finding somewhere to eat in Palolem is not a problem, although the locals have to buy in most of their fish from Margao and Karwar. The one outstanding place is the Classic Restaurant, where one can tuck into delicious, freshly baked Western wholefood and cakes. More popular among budget travellers, though, is Sun 'n' Moon, behind the middle of the beach; when it closes, the die-hard drinkers head through the palm trees to nearby Dylan's Bar, which stays open until the last customer has staggered home. For optimum sunset views of the bay, head for the obscurely named Found Things bar and restaurant, at the far southern end of Palolem beach, which faces west. Travellers on tight budgets should also note the row of tiny Bhaji stalls outside the Beach Resort, where one can order tasty and filling breakfasts of Pao Bhaji, fluffy bread rolls, Omlettes and Chai (tea) for next to nothing. There are a lot of eating joints over here at the beach. Getting food is not problem at all at this beach. There is also plenty of scope for those who wants to enjoy booze at the beach. Bars are also there at this beautiful beach. There are Buses that run between Margao and Karwar. Number of buses come to Palolem daily from Margao. One can find tents, guesthouses, simple rooms in the local family homes, etc at this beach. These places with have theminimun facilities so that the travellers who come over here can stay there and enjoy the trip to this beach. Cycles On Rent : Cycles may be rented from a stall halfway along the main street. Phone : The village has only a couple of public telephones, but avoid the one in the beach resort, which charges more than double the going rate for international calls, and head for the reasonable ISD/STD booth next to the bus stop. Exchange : At present, there is nowhere in Palolem or Chaudi to change money; the nearest bank with a foreign exchange facility is in Margao.